When all you need is a basic understanding of joint mobilization techniques, supplemented by succinct and demonstrative examples, look to Cram Session in Joint Mobilization Techniques: A Handbook for Students & Clinicians for quick, at-your-fingertips facts. 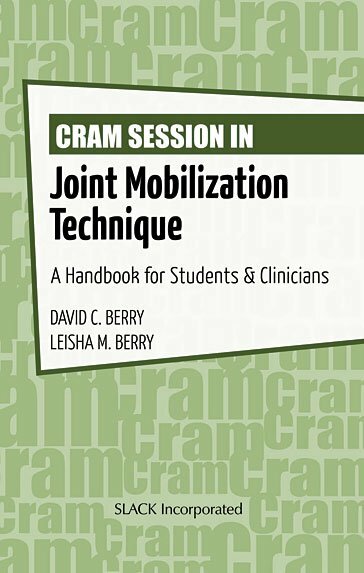 Cram Session in Joint Mobilization Techniques by Dr. David C. Berry and Leisha M. Berry is a descriptive quick reference that provides the rehabilitation professional with a detailed yet easy-to-digest approach to joint mobilization techniques. Organized into quick-reference tables and concise descriptions of each technique, this resource offers an efficient way to learn the cognitive and psychomotor skills necessary to competently perform joint mobilization techniques. Cram Session in Joint Mobilization Techniques: A Handbook for Students & Clinicians is an informative, well-organized handbook for all students and clinicians in athletic training, physical therapy, occupational therapy, osteopathic medicine, and other rehabilitation professions. Athens, Ohio, where his cognate work was in Athletic Training and College Teaching. He holds a master’s of arts in Physical Education—Athletic Training from Western Michigan University, Kalamazoo, Michigan, and master’s of arts in Teaching from Sacred Heart University, Fairfield, Connecticut. He also holds a bachelor’s of science in Health Education from the University of Massachusetts-Lowell, Lowell, Massachusetts. Dr. Berry practiced as an athletic trainer in the collegiate, high school, and outpatient rehabilitation settings before moving to the academic setting. He is an active member of the Board of Certification for the Athletic Trainer (Omaha, Nebraska) and the American Red Cross at the national level serving on the Scientific Advisory Council, which is charged with continuously monitoring a variety of health and safety programs for important developments in emergency science and conducts its own review of the research, with all subcouncils participating. He is also an active board member for the Sports Education Council for the Michigan Cardiovascular Institute, Saginaw, Michigan whose goal it is to educate the community and professionals related to emergency planning and sudden cardiac awareness in organized sports. Education Journal and Section Editor in Administration, Professional Development, and Pedagogy for the Journal of Athletic Training. Dr. Berry’s service to the profession and his students has resulted in being named a recipient of the Board of Certification’s (Omaha, Nebraska) Dan Libera Service Award, Faculty Recognition Award for Scholarship (Saginaw Valley State University Faculty Association), Excellence in Teaching (National Society of Leadership and Success at Saginaw Valley State University), National Athletic Trainers’ Association (Dallas, Texas) Service Award, and Most Distinguished Athletic Trainer. Leisha M. Berry, PT, MSPT, ATC, AT is a licensed physical therapist and athletic trainer with 20 years of experience in clinical-based practice and in higher education. Mrs. Berry earned her master’s degree in Physical Therapy from the University of Massachusetts-Lowell, Lowell, Massachusetts. She also holds a bachelor’s of science in Exercise Physiology from the University of Massachusetts-Lowell. Mrs. Berry has practiced as a physical therapist in skilled nursing, acute care, chronic pain, home health, and outpatient rehabilitation settings. She has been an adjunct faculty member teaching a wide variety of athletic training courses, including therapeutic exercise for 3 different athletic training programs. She currently serves as a preceptor for athletic training and physical therapy students. Currently, Mrs. Berry oversees the day-to-day operation of her outpatient facility, Physical Therapy & Rehab Specialists, Midland, Michigan, serving as the Clinic Director of Rehabilitation. She has published and presented at the state, regional, and national levels on a variety of topics and mentors athletic training students pursuing case studies. She has coauthored 2 textbooks, including Athletic and Orthopedic Injury Assessment: Case Study Approach. Dr. Berry and Mrs. Berry reside in Saginaw Township, Michigan with their 2 children, Tyler and McKinley.